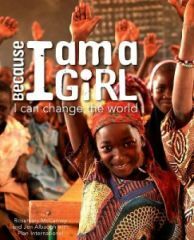 The book takes the topic of girls (mostly in impoverished conditions) and analyses how girls are marginalized due to the impact of poverty, lack of educational opportunities, and sociological and cultural factors (forced marriages, etc). This factual information is individualized through the personal stories of girls who overcome, who feel empowered to change their lives provided they are given the opportunity to do so. These individual stories and general sections of the book point to only conditions in Africa, Asia, and Latin America. However, when the story of a girl who lives in a “first world” country is cited as an example, she invariably belongs to a “minority” group (for example, Native American) and her oppressive conditions stem from her culture or community. The text does not explore if mainstream society discriminates against her. The book is well organized and well written, and the above diverse matter is well integrated. It is certainly better than a country survey type of book. To be balanced, the book could have explored how girls from mainstream society are discriminated against (for instance, gender bias, standards of beauty, glass ceiling, etc. ).